On the evening of October 19th, 2013, the Prince of Peace Catholic Newman Center at the University of Washington launched the first installment in its newest young adult program, Saturday Night ALIVE. Based on the model of the popular Catholic Underground program, Saturday Night Alive seeks to bring together young adults from the whole greater Seattle area for a night of prayer, fellowship, and entertainment. The evening consisted of an hour of adoration, a brief intermission for coffee and socializing, and a performance by local Catholic artists. Over 100 people showed up for the event and filled the Newman Center’s chapel. Adoration began with the Exposition of the Blessed Sacrament, followed by Evening Prayer from the Divine Office. 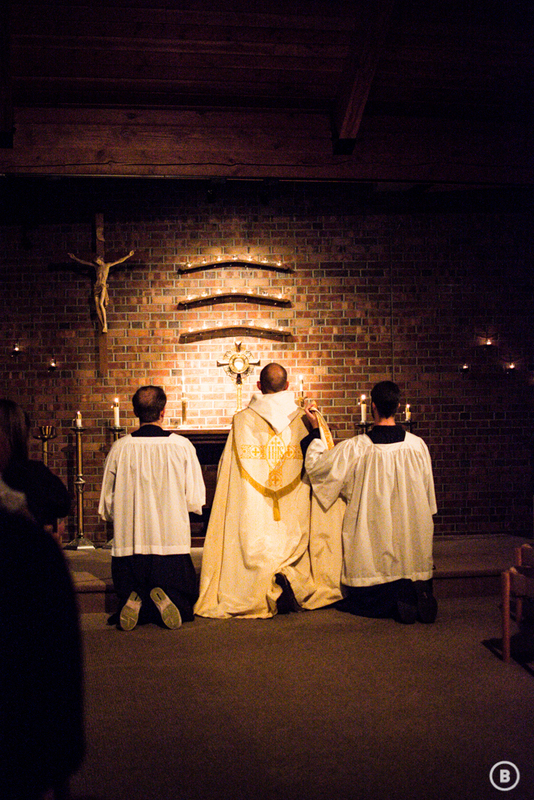 Adoration continued as a pleasant combination of hymns, prayers, and silence. The chapel was illuminated simply by candles and a spotlight on the Blessed Sacrament. Three priests were offering Confession during this time of prayer, and many of those assembled chose to receive this sacrament. As adoration concluded, the Blessed Sacrament was reposed and the lights came on. The attendants were told that there would be a brief intermission before the performance portion of the night. Nearly everyone in attendance proceeded to squeezed into the Newman Center’s lobby for tea, coffee, snacks, and socializing. Young adults from all over Seattle met and talked with one another. lls. The music was performed by Dawn and Orlando, two Newman Center choir alums. Dawn and Orlando’s music helped the crowd encounter God’s love in a different way than adoration. By expressing their faith through the medium of music, they became a testament to God’s presence all around us – He is not just in the silence of adoration, but also in the joyous sounds of passionate music. And when the music ended, the people stayed. They still had conversations to finish, friends to meet, and a community to build. This event was a pilot program to gauge the interest of local Catholic young adults in a program that combines prayer and culture. The success of the first Saturday Night ALIVE has shown that there is indeed a demand for this type of event in the Seattle area. The next Saturday Night ALIVE is planned for November 16th, and starting in January it will continue on the third Saturday of the every month. The volunteers who helped put on this program hope that Saturday Night ALIVE will develop into a city-wide event that will reinvigorate the faith of Catholic young adults all over the Seattle area.